Poke each sausage a few times with a paring knife or fork (this helps release steam as they cook). 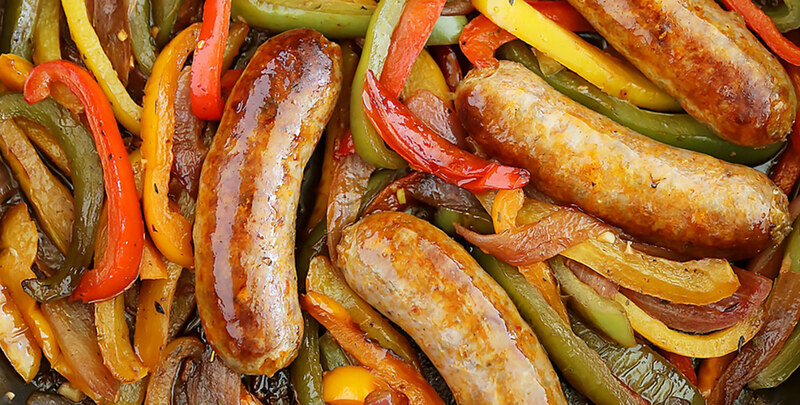 Once browned, remove sausages to a plate. Set aside. Increase heat to high. Add onion and pepper slices. Toss to coat in oil and sear vegetables until slightly blackened, stirring often. Add garlic and cook for 1 more minute. Add Holland House® Red Cooking Wine, scraping bottom of pan with a wooden spoon to release blackened bits. Simmer wine until reduced by half. Add Italian seasoning and crushed red pepper flakes. Stir well to combine. Add sausages. Bring to a simmer and then reduce the heat to low. Cover and simmer until peppers are soft and sausages are cooked through, about 10 minutes. Bold Boost #14: Pour ½ cup of Holland House® White Cooking Wine in your pan during the last two minutes of roasting for juicy chicken bursting with flavor.